Note from the author: It's important to let this dry in between coats. Watch out for its opening and closing before it is completely dry because it can stick easily! Paint the inside of the trunk dark brown. Let dry. Apply a second coat, making sure everything is completely brown. You may need a smaller brush for around the hinges. Let dry. Coat the entire inside with a layer of the Modge Podge. Let dry before starting on the outside. Paint everything on the outside dark brown except the straps and the hardware (see photo). Let dry then apply a second coat. Paint the straps with black paint. For the hardware (all the metal pieces) paint them all black and after about 30 seconds, rub some of the paint off to give them a worn look. Let dry. Paint a layer of crackle medium over the dark brown areas only. After the crackle medium dries (it doesn't take long), lightly apply the light brown paint over the dark brown areas a little at a time. Apply a little paint, wait about 30 seconds and then rub with the paper towel. See what looks and works best for you on this. You want it to look a bit cracked and worn and you don't want just a coating of light brown paint. You should be able to see the dark brown. After achieving the look you want and letting everything dry, touch up any areas that might need it. Let dry. Cover the entire outside of the trunk with Modge Podge. Let dry then apply a second coat. Let dry. 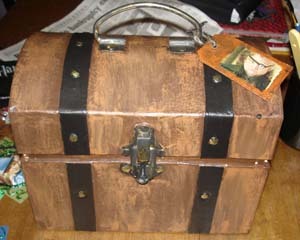 Use the same dark brown paint that you used on the outside of the trunk and coat the paper tag, front and back. Let dry. Place your photo of Mad Eye in the center. Paint the dark brown around the edges of the photo so it looks framed on the tag. To give the tag a worn look go over the edges with the lighter brown paint, use a little sand paper around the photo. Using a bit of yarn, string, etc., tie your tag onto the handle of you trunk and you're done!! Another good idea for this would have been to grab some trunks in every size, from biggest to smallest and paint each one. Then nest the trunks inside of each other. © Dani Johnston's tutorial was used with permission.